This American Arts and Crafts Style sconce is and H.J. Nick original work. This original fine art lighting fixture is built using old world materials and techniques. Made of pure, hand forged wrought iron (frame) and copper (panels), with a fine art (iron oxide) heat applied patina finish. Handcrafted lighting that is not only inspired by, but built with the same hand and quality standards that were used to build the originals. Each piece is a one of a kind work of art, and is never mass produced. 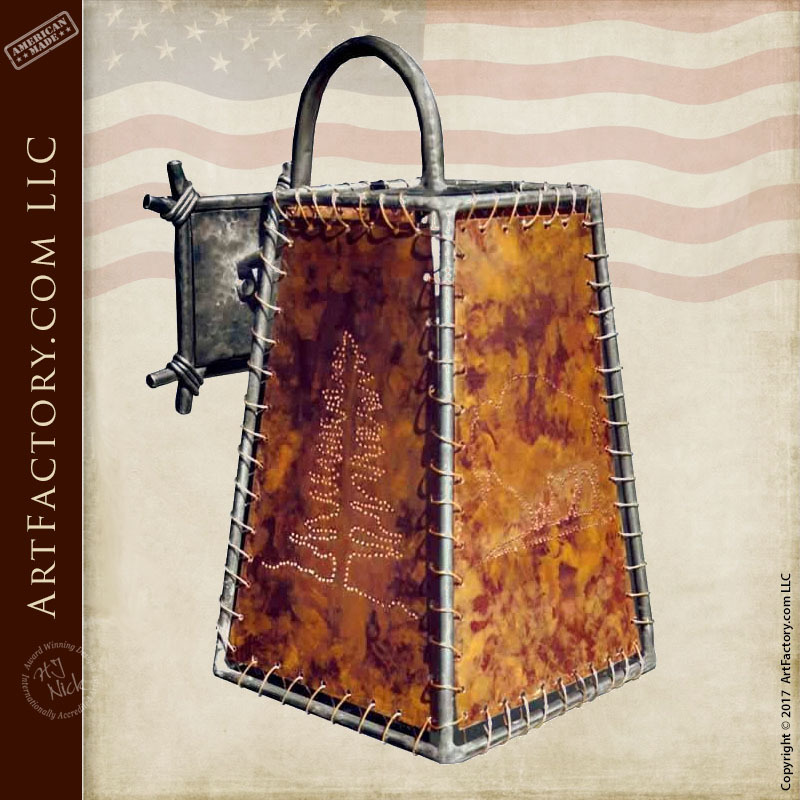 The Buffalo Theme Copper Lighting Sconce is built with only pure, solid metals, hand forged by master blacksmiths. The frame is constructed of solid wrought iron. The copper panels are hand shaped and laced to the frame with copper wiring. These panels have been perforated with buffalo and evergreen designs to give it a classic, rustic, American Western style feel. Never painted or powdered coated, the colored finish is a heat applied iron oxide patina that is guaranteed to never fade, chip, or scratch. Furthermore, these finishes are heat applied to the metal at over 1000 degrees to bond the color with the metals. Additionally, as with all of our fixtures, thisBuffalo Theme Copper Lighting Sconce is UL listed. We work with dealers, builders, interior designers, and home owners to create custom handcrafted chandeliers, lighting, lamps, and sconces for your residential or commercial property. Our custom light fixtures are available in any size, style, and finish by our American craftsmen, hand made using old world techniques to create a luxury fine art furnishing for your home or business. All hand crafted lighting is built using the highest quality materials and all UL listed. Order any themed lights, the choices are endless when you order your custom chandeliers and lighting from ArtFactory.com, call 1-800-292-0008.